"My wife liked your book. She would read parts out loud that she had heard me say. I've yet to read it, but my wife informed me on most everything. She did not read the entire book to me! My daughter wants her copy. I keep forgetting to give it to her. They really need to read it. It could save them a lot of problems down the road." 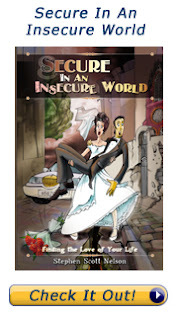 Who do you know that reading Secure In An Insecure World "could save them a lot of problems down the road?" Consider purchasing a few copies to give away now, or to have on hand for later. You can find the book on Amazon in English or Spanish. It is also an e-book for Kindle or I-pad, etc. One Encouraging Church. Sanctuary Baptist Church in Atlanta is one of our faithful supporting churches. They baptized 20 people a few weeks ago! I was impressed, so I asked the pastor, Rodney Hall, to tell me how that happened. It is a beautiful story. (Background: I have been friends with Rodney for over 20 years. Our friendship began when our daughter Whitney became friends with his niece April in school in Dacula.) We both concluded that the reason their church has seen so many come to faith in Christ was because 1) they wanted it; 2) they sincerely loved unbelievers; and 3) they shared the gospel whenever possible. We also agreed that the underlying reason was that God loves those who are lost and He puts His love for others in our hearts when we yield to Him. It is believed that Jesus Christ walked 6 miles to be baptized by John the Baptist. Inspired by their Savior’s example, a group of these new believers also walked 6 miles that Sunday morning to get baptized. One of them, Rodney’s son-in-law, Zack, left his house at 6 am and walked 14 miles carrying a pack. Zack arrived shortly after 10 am to make his public declaration of faith in Jesus Christ. Inspiring lives! Southeast Pastors and Wives Conference Danelle and I enjoyed sweet fellowship with the pastors and their wives last weekend at our annual conference. John and Sandy Hopler encouraged us about marriage. We also discussed plans, discipleship, and God’s sovereignty and free will. 1) Pray for several unbelievers we are sharing the gospel with to get saved. 2) Pray for new groups to be started here in Atlanta. 3) Pray for wisdom to build and train others in the Southeast who are in house churches. 4) Pray for peace in Ukraine as fighting has renewed and people are dying and suffering. Thank you for your prayers and loving support of our lives and work! Parenting Seminar Danelle and I thoroughly enjoyed teaching a parenting seminar to parents from Florida last month. God definitely answered your prayers for us and all who attended the all-day event in Jacksonville. It was refreshing to Danelle and I to see so many mothers and fathers seeking help in raising their children to know and follow Jesus Christ. We spoke about the importance of our relationship with God, and the need to be role models to our children, since “more is caught than taught.” Our seminar title, “Your Children Are Watching,” emphasized that our children will see Christ in us when we love our spouse. Here are a few photos of some of the couples who attended. Meredith and Nathan Our daughter Merry got engaged to Nathan Evans from Americus, Georgia. They will be married August 23rd. We praise God for bringing a godly young man into Merry’s life. We are excited and thankful for what He is doing in their lives to make them even more effective for Jesus Christ and building His kingdom. They both work for Habitat for Humanity and plan to continue living in Americus after they get married. Please pray for their faith in Christ to grow as they take this big step of commitment to Him and one another. They will need the grace of God, as do we all. Thank you!